The future is vastly more exciting and interesting if we’re a space faring civilization and a multi-planet species than if we’re not. You want to be inspired by things, you want to wake up in the morning you think the future is gonna be great, and that’s what what being a space faring civilization is all about. Believing in the future and thinking that the future would better than in the past and I can’t think of anything more exciting than going out there and being among the stars. How is SpaceX going to pay for this? 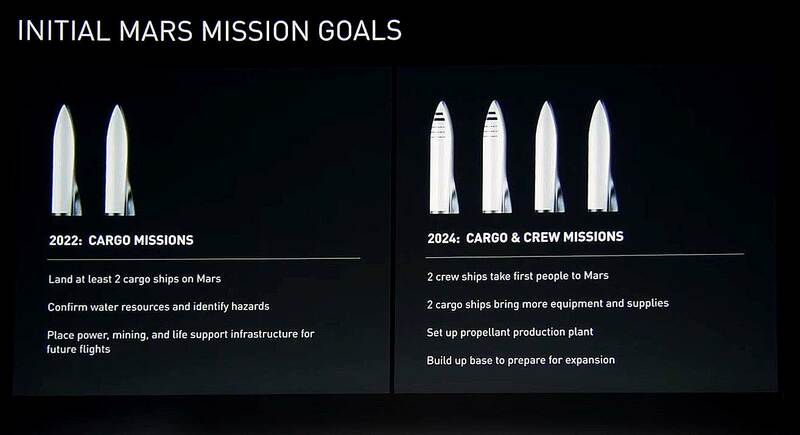 Elon Musk said that the most important item to communicate in this updated presentation is that SpaceX now has a plan that can actually be funded. 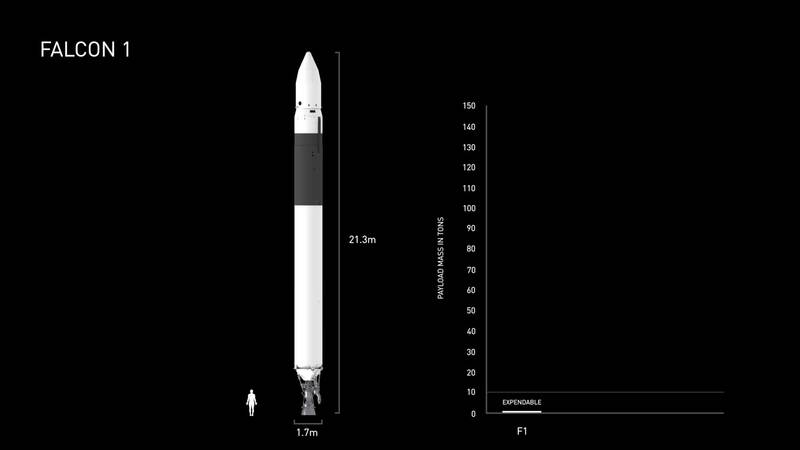 A smaller BFR (the code name for the new rocket booster and ship) will make their current rockets, Falcon 9, Falcon Heavy and the Dragon capsule redundant. This way the resources currently being applied to those three spacecraft can be dedicate to the new 9 meter diameter BFR. 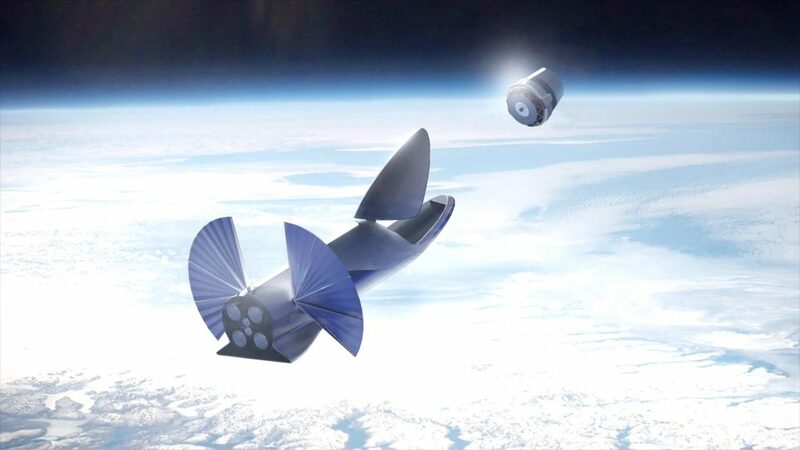 Due to a larger scale ship, and 100% re-usability, the profit margins on payloads launched using BFR will be much greater, allowing SpaceX to rapidly build out a fleet of interplanetary ships. Where is SpaceX at in the the development process of the technologies necessary for BFR? SpaceX has tested a deep-cryogenic tank at the older 12 meter diameter which holds 1200 tons of liquid oxygen. It was tested on an ocean going barge to specs, and then beyond to the breaking point. It shot 300 feet into the air, and was recovered for study of how it failed. 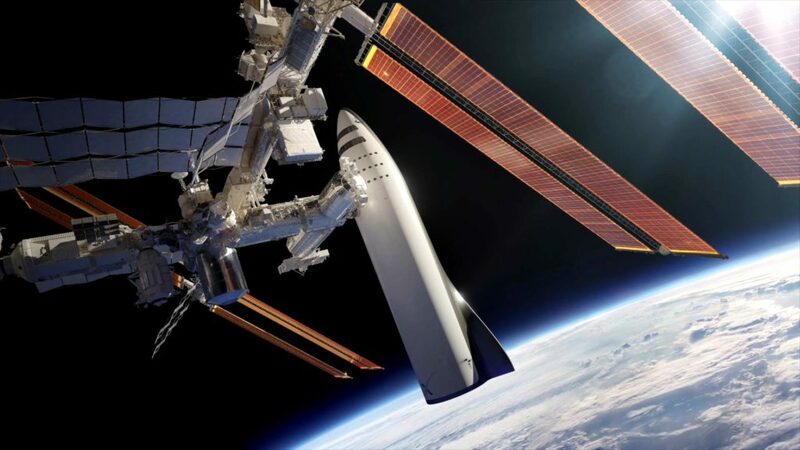 SpaceX has developed a new carbon fiber matrix that can handle both the very high pressure, and extremely low temperature of the liquid oxygen. The new carbon tank design is very important to make a light spacecraft. The Raptor is SpaceX’s new methane-oxygen fueled rocket engine that will be used in the BFR on both booster and ship stages. 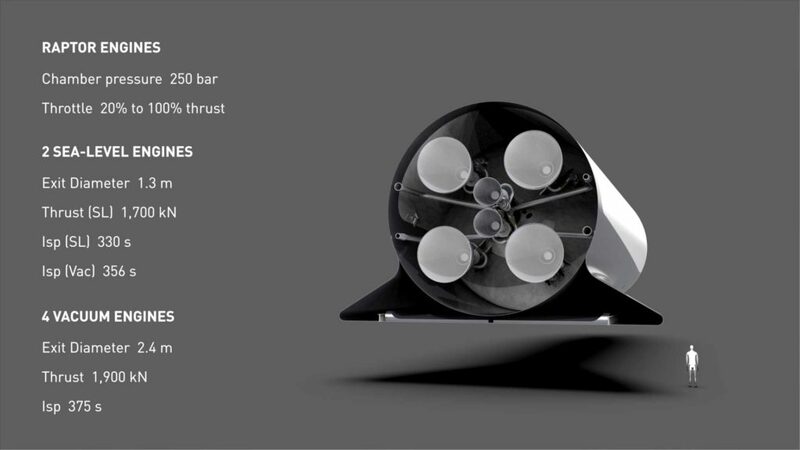 It will be the most power rocket engine ever made. There are two versions, the Raptor Vacuum for use in space, and the Sea-level Raptor for use during landing. So far, SpaceX has tested the Raptor for 1200 seconds of firing across 42 main engine tests. The longest test ran for 100 seconds, only limited to fuel tank size. A 40 seconds burn will occur on a typical for Mars landing. The test engine operates with internal pressures at 200 Bar (atmospheric pressure at sea-level,) while the flight engine will run at 250-300 Bar. Propulsive Landing needs to become routine and perfected, so that it is always reliable. SpaceX has had 16 successful landings in a row, all with no engine redundancy on Falcon 9. Falcon 9 landing is done on a single engine, while BFR will always have a spare engine, in case one fails during landing. SpaceX is now confident enough on the precision of their landings to allow BFR to land back on its launch mounts, without the need for heavy landing legs. 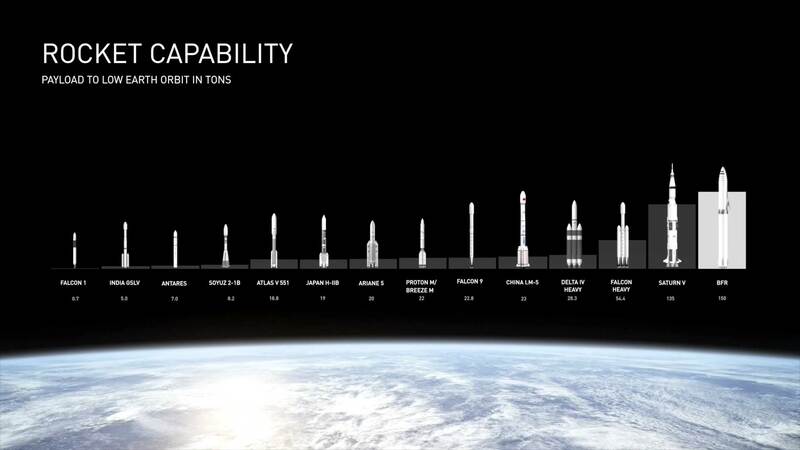 SpaceX’s goal of interplanetary travel and settlement require an unprecedented rate of launches. 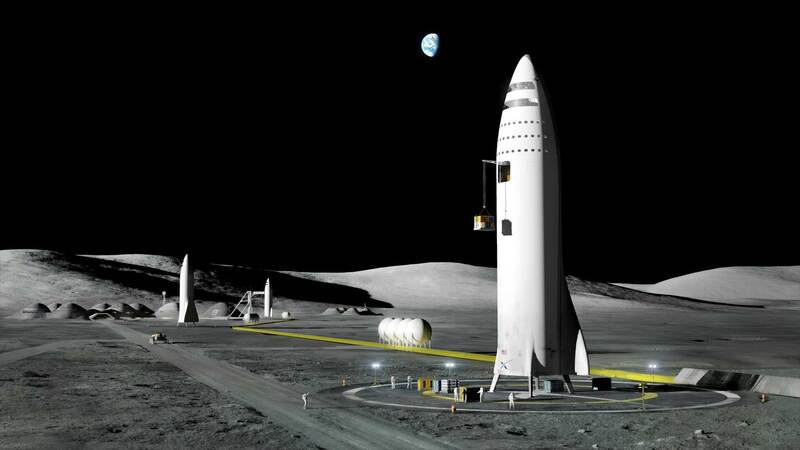 A moon base or mars base will require thousands of launches. If that sounds like fantasy, please note that SpaceX’s launches are growing at an exponential rate. Around 60 launches are performed globally per year. 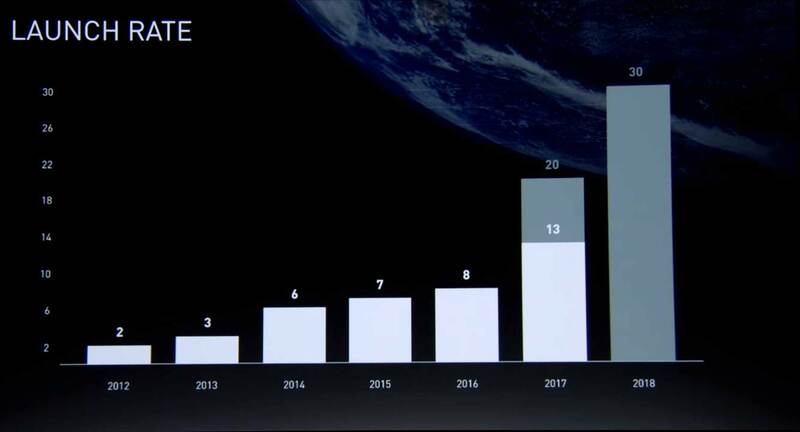 Five years ago SpaceX launched just two rockets per year, by next year they are on track for thirty launches, which constitutes 50% of all global launches. With all of those launches and on-orbit refuelings, automated rendezvous and docking must be perfected. SpaceX has been doing automated approaches to the ISS using Dragon 1, and then using the Canada Arm robotic arm to do the final berthing. The new Dragon 2 spacecraft will accomplish rendezvous and docking completely autonomously. Entering the atmosphere on any planet requires a heat shield. SpaceX chose to develop their own ablative heat shield technology for Dragon, called Pica-X. There have already been many revisions, and the technology is very mature. Falcon 1 was sized for a minimum use payload to orbit, which turned out to be 1/2 ton to Low Earth Orbit. This rocket was entirely disposable, like most rocket system before it. Falcon 9 first launched on June 4th, 2010. The initial version was disposable and reuse was developed over time. After learning how to achieve landing through many failed attempts, the first Falcon successfully landed at Cape Canaveral’s LZ-1 in December 2015. Ultimately SpaceX envisions Falcon 9 re-usability to reach 70-80%. This will include the booster and cargo fairings. Falcon Heavy turned out to be much more complex than SpaceX anticipated, with many delays. 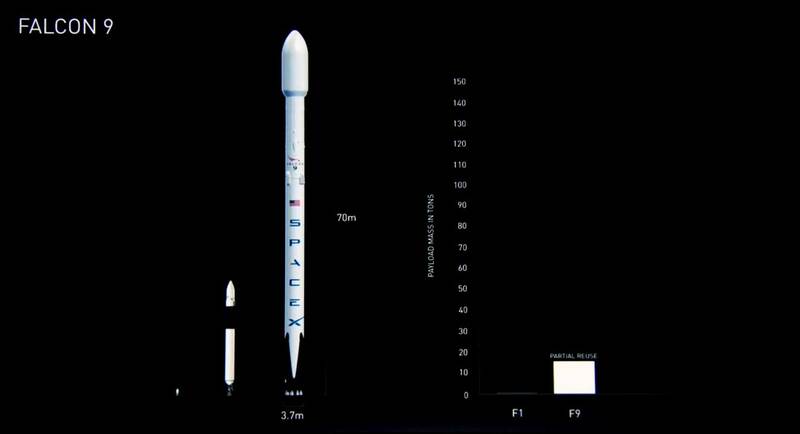 SpaceX had to redesign almost everything besides the upper stage to handle additional loads. Currently the boosters have been tested and are on their way to Cape Canaveral. Falcon Heavy should launch by the end of 2017. All three stages and eventually the fairings will be reusable. 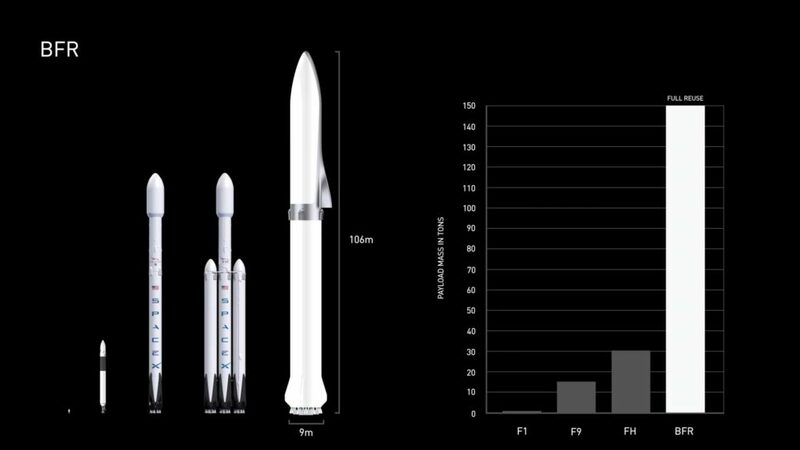 The new BFR will be 9 meters in diameter, and 100% reusable, with a payload of 150 tonnes of payload to orbit. 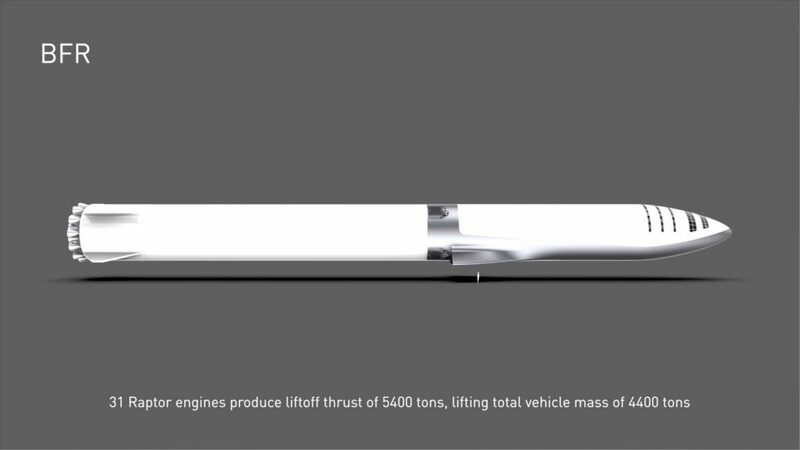 The BFR booster stage will use 31 Raptor engines providing up to 5400 tons of thrust. The entire vehicle weights 4400 tons at launch. 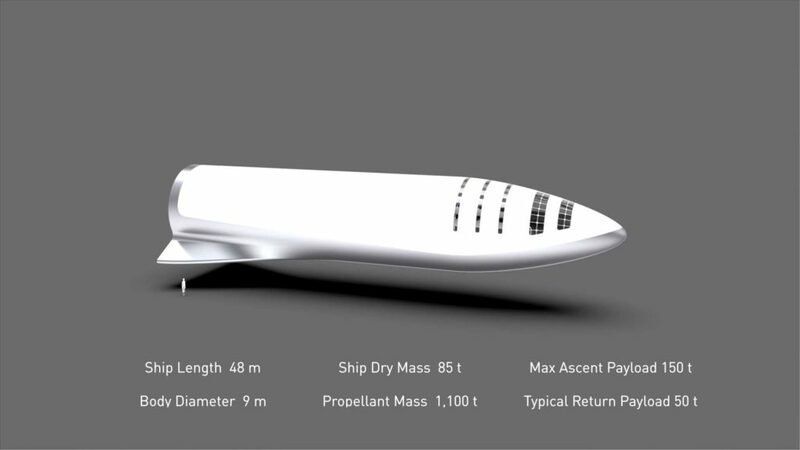 The BFR Ship is like the upper stage of Falcon 9 and Dragon, combined into one ship. Engine section, propellant tanks, payload bay that is 8 stories tall. 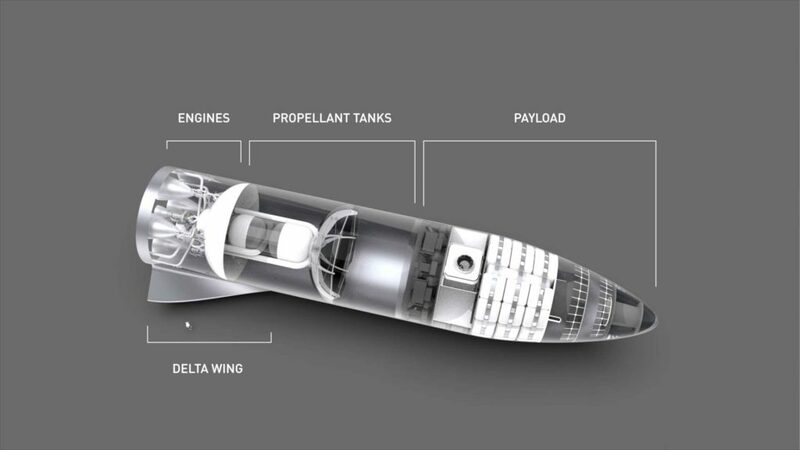 Delta wings allowed SpaceX to expand the mission envelope of the BFR spaceship. Depending on whether you are landing on a moon with no atmosphere, thin atmosphere, or thick atmosphere, with a range of payloads in the front, you need to still balance the ship. The wings allow roll and pitch control across all scenarios found in our solar system. The pressurized cargo area is 825 cubic meters. This is greater than the pressurized area of the world’s largest passenger jet, the A380. Due to the multiple month trip time, passengers will have a cabin, not just a seat. 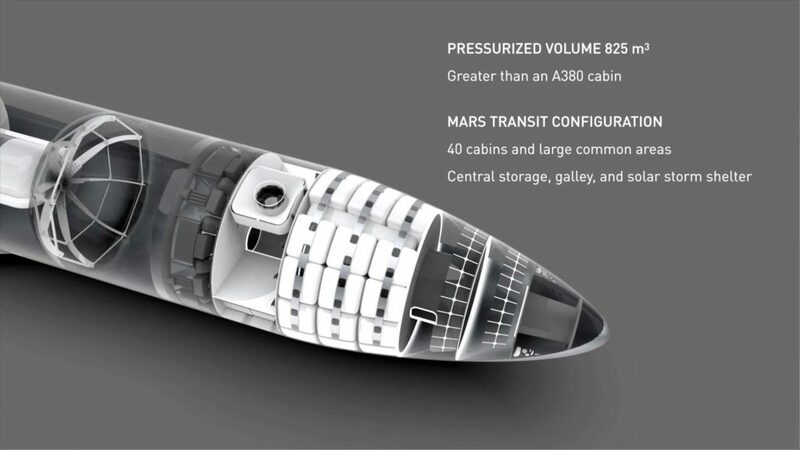 The BFR ship will have 40 cabins, with 2-3 people per cabin. Normally, 100 people per trip to Mars. An essential pressurized storage, galley, solar storm shelter, and entertainment area. 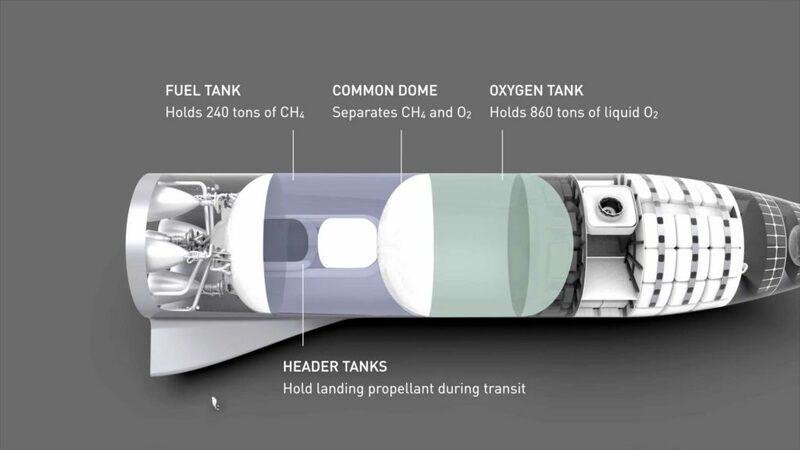 The center of the BFR ship is where the propellant tanks are located. Sub-cooled methane and oxygen allows 10-12% density increase. 240 tonnes of methane, and 960 tons of Oxygen. Header tanks inside the main tanks allow consistent fuel flow even while ship’s orientation is changing during landing. Refueling in orbit is required for BFR to leave earth’s orbit. There will be two versions, the transports ship and an tanker vairant. The two ships will use the same mating interface and fill lines as when connected to the booster. Moving the fuel is accomplished by accelerating the entire stack in 1 direction, moving the fuel from one to the other. The launch capability of the BFR is greater than the Saturn V rocket that took us to the moon, and the BFR is completely reusable. The most important feature of the BFR is that due to its full reusability, the BFR will become the least expensive launch system in history. The value of refilling an orbiting spacecraft is also extremely important. If a BFR is not refueled once it orbit, it is still the most capable rocket in history. 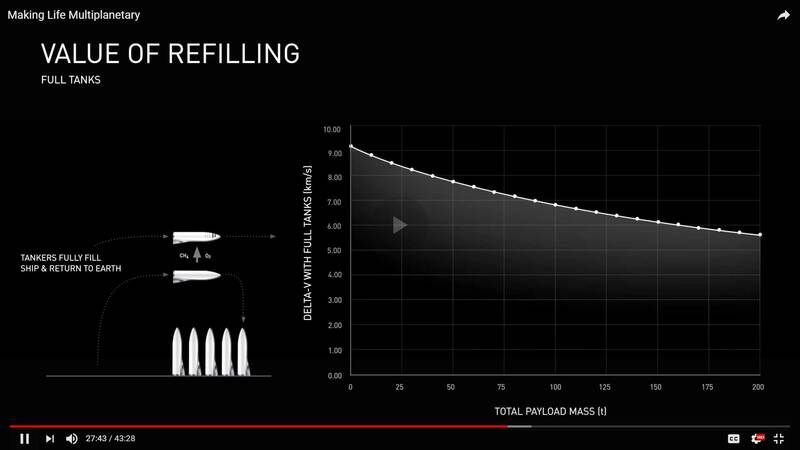 Refilling allows the BFR to go to the moon, Mars, and anywhere else in the solar system. SpaceX is going to pay for the BFR program by cannibalizing their own products, Falcon 9 and Falcon Heavy. 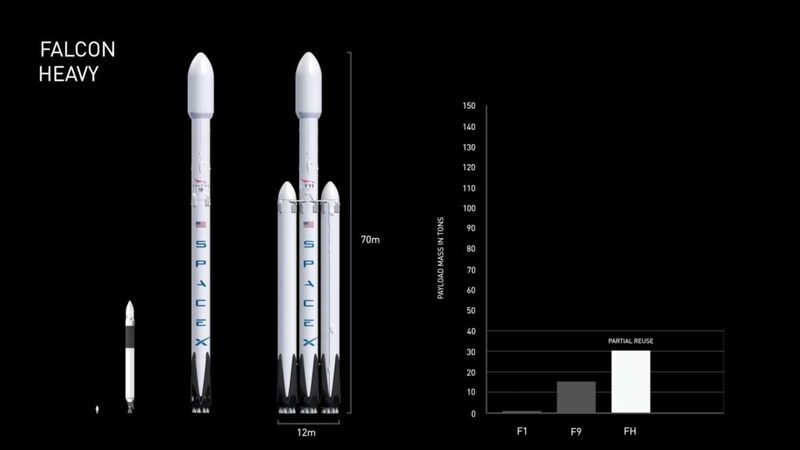 The plan is that SpaceX will build enough Falcon 9 and Falcon Heavy rockets ahead so that after BFR is first developed, customer will have a choice. In the satellite market, a 9 meter diameter BFR will allow a new class of satellite size to be launched. For example, a new Hubble telescope could be built with a single contiguous mirror that is ten times larger than Hubble. Other uses may include cleaning up space debris, up to 50 tons down mass. Larger satellites, or larger quantities of satellites. BFR can also replace Dragon’s ISS servicing and human transport capability. 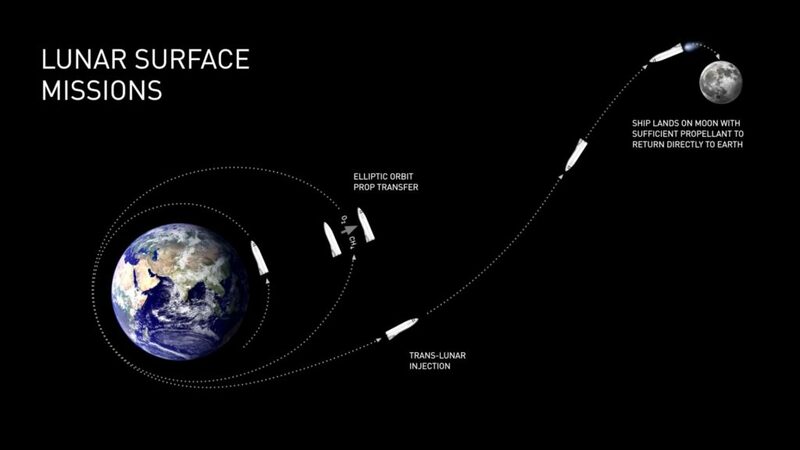 The BFR can go to the moon, land, and return with no propellant production on the surface of the moon, unlike mars. 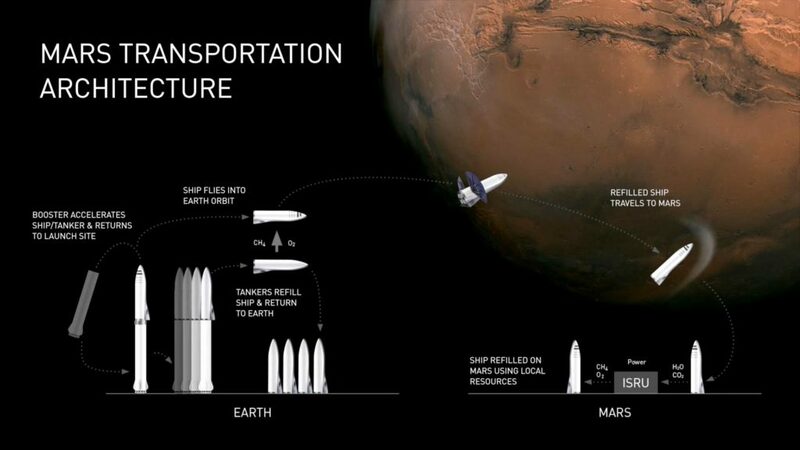 SpaceX has calculated that this is possible with a high elliptical parking orbit for and refilling the propellant tanks using a tanker ship. This will allow the creation of a moon base. BFR will allow creation of a settlement on Mars. First launch the BFR with people and cargo, refill propellant until it is completely full, then cruise to mars. Due to lower gravity, no booster stage is required to leave Mars. Though a propellant production plant will be required on Mars, to allow return to Earth. SpaceX has provided a true-physics simulation of landing on Mars. Mars has a thin atmosphere, allowing you can remove almost all of the ship’s energy using aerodynamics. Due to the very high speed of Mars entry, some wear and tear will occur on ablative heat shielding. SpaceX has proven their retro-propulsive technology many times by landing Falcon 9. The delta wings will help the ship stay oriented properly once it has entered the atmosphere. Multiple phase build out. First with one ship, then 3, then an entire city on Mars. This first mission, in 2022 will be 2 ships. The goal is to find best sources of water. The second mission, in 2024 will have 4 ships. 2 crew, 2 cargo. The goal is to build the propellant plant and propellant depot. This will require a very large array of solar panels, mining and refining equipment for water, and then will use the Sabatier reaction to produce propellant. 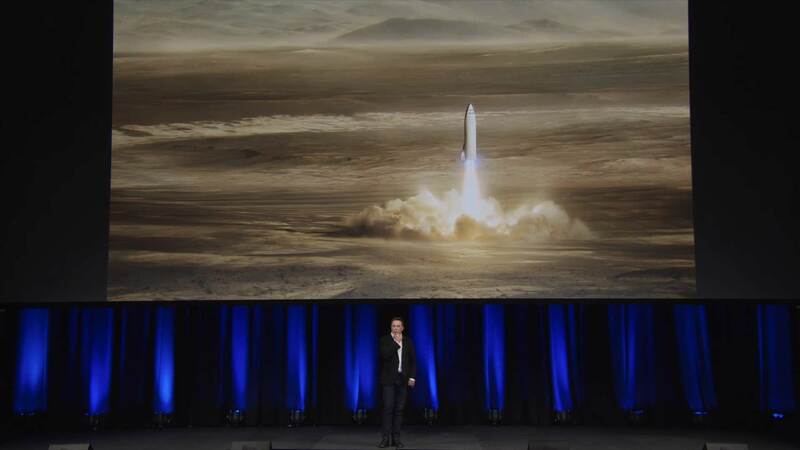 And one more thing… there is a use for BFR closer to home: Earth to Earth – Anywhere on earth in under 1 hour. 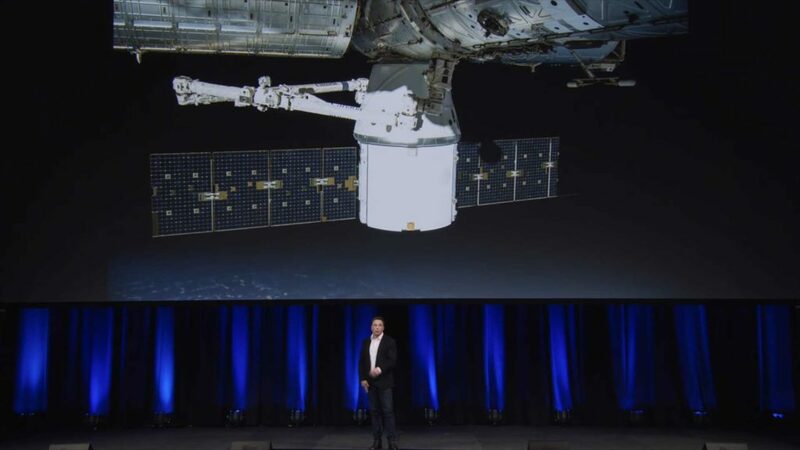 Please enjoy the full video from SpaceX at the International Astronautical Congress (IAC) in Adelaide, Australia.